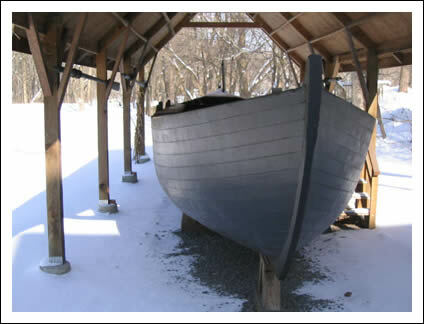 The Durham Historical Society (DHS) has a replica Durham boat that can be viewed by anyone in its pavilion located on the green next to the Durham Post Office on Durham Road in Durham, PA. 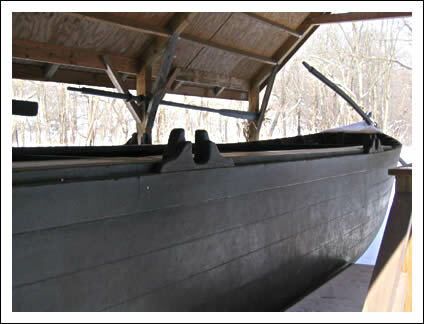 The boat was used for a number of years in the annual December 25th Washington Crossing the Delaware event at Washington’s Crossing, PA until being rescued by the DHS. Testimony by some historians via their interviews (History of Bucks County, by W.W.H Davis, 1905 and J.H. Battle, 1887) indicate that the first Durham boat was built by Robert Durham on the river bank near the mouth of the cave at Durham, circa 1730, but all of this is hearsay evidence that has been passed down via the generations. Robert Durham was stipulated to be a boat builder by trade in certain papers left by B.F. Fackenthall Esq., a native of Durham who indicated that he was told by his grandfather that Robert Durham was the first builder of a Durham boat in Durham. Some folks conclude that Robert Durham worked at the Furnace when the first boat was built. But, there is no hard evidence for any of this. What is known is that the Durham Boat was double ended (sharp at the front and stern), flat bottomed, sixty-six feet long, six feet wide, three feet deep, used but twenty or so inches of water when fully loaded, and was propelled along the shoreline by setting steel tipped poles into the river bed, the other end against the boatman’s shoulder who walked from the bow to the stern of the boat. Oars were used in the center of the river and to cross the river say at Bristol. A crew of three to six men was used per boat. At one time there was a fleet of a thousand of Durham boats on the Delaware giving employment to several thousand men whose job it was to move cargo down the river to Bristol and Philadelphia. Durham boats were “confiscated” by George Washington and used to carry his army across the Delaware River at a spot now known as Washington’s Crossing, PA in order for his troops to surprise the Hessians at Trenton on Christmas Day, 1776. A Durham Boat could make the trip from Durham to Philadelphia in one full day. Depending on the size of the boat, it could carry ten to seventeen tons of cargo. The return trip was more arduous as it had to proceed against the current. Much muscle was needed by the boatmen to pole the boat back to Durham. Controversy exists about the boat. Mr. Battle, in his 1887 book, says the boats were only 20 feet in length, used a crew of five and could progress at a rate of twenty-five miles per day when moving against the current. The replica boat owned by DHS measures: Overall boat Length 39′, width 7′ 3”’, depth 3′ 6”, Sweep length 24′ 6”, Oars 16”, Setting poles 14′. Another historian (Richard H. Hulan) discussed the so called “Batso Boat” that was found in a New Jersey pond when it was drained in 1957. He claims that the Batso Boat can be dated concurrent with the Batso Furnace (which ceased iron production in 1848) and that the functions of the craft was the bulk transportation of iron ore. He ties the Batso boat quite neatly in with the Durham boat which was used for a similar purpose, the transport of heavy iron product down stream. Is the Batso Boat a Durham Boat? Are they related? Hulan pointed out that no physical record can be found of Robert Durham and that if he was employed at the Durham Furnace that it would be very unlikely that an English foundry man had either the skills or the depth of tradition necessary to invent, build and give his surname to the boat that was to become the primary shallow draft vessel for round trip commerce on the Delaware River prior to steam. Hulan thinks that we should direct our attention to the working boatmen and boat builders on the river and at that time the Swedes and Finns were those people. The Durham Furnace came into blast (began to make iron) in 1728 and it needed to move product then not later. Remember that there were no residents in Durham in 1728 just waiting to go into the business of hauling iron product to Philadelphia much less a fleet of boats. However, the Swedes and Finns had been on the river for ninety years and they had been using the waterways for the transporting of people, furs, grains, flour, and tobacco over the same waters. By 1728, the year the Durham Furnace came into blast there were dozens of Swede/Finnish family businessmen whose sole purpose was boat building and transport. Other ethnic groups had seafaring/boat building backgrounds, but the Scandinavian people had been building similar boats to the Durham boat in their native countries for centuries, and according to Hulan, no such similar boats were to be found in the history of the English or Dutch. They were masters of deep water vessels and not these smaller and light drafted boats. 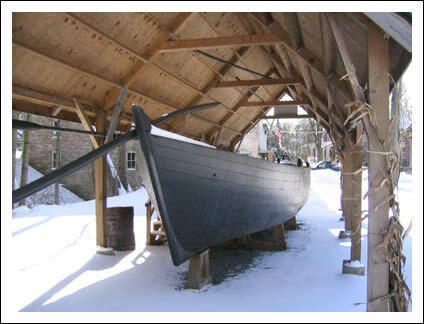 The two models that were made for centuries in Scandinavia were the “Church Boat,” and the “Rapids Boat.” The boats were used in lake waters and in river waters in Sweden and in areas that carried a great number of immigrants to Pennsylvania. These new people oriented their farms and their churches to the existing rivers which, prior to roads, was their only method of transportation. It is also noted that the old iron industry in Sweden was greatly analogous to that found in Durham, one that had to move its product from relatively isolated furnaces on shallow streams down to deep water ports or areas of centralized populations. It seems axiomatic that the water people would employ the same technology used in Scandinavia in their boat building here in America. That boat style was long, narrow, double ended, and operated by minimal crews using poles and oars. Why reinvent the wheel or boat in this case? Are then the Durham boat and the Batso boat evidence that Swedish technology was the causative factor of this design and not the mythical Robert Durham? It is evident that the form of the Durham boat can be found in rivers all over the Eastern seaboard where they are shallow and sometimes rapid. In other places they were called Keelboats, Mohawks, Schenectady boats etc. but usually all attributed, in general, to the Durham boat style and the Delaware River. The form of the boat was simply the best form to be used to move cargo up and down the extensive, large and occasionally shallow rivers. Hulan concluded that the Batso boat and the Durham boat were born of Swedish or Finnish ancestry. He further dismisses the notion that the boats were an adaptation of the Indian canoe though concedes that the Indian canoe double ended style is equally adapted to the shallow rivers and steams of North America. The Durham boat style came into disservice with the advent of canals where yet a different type of construction and style was used to carry freight. The Canal Boat went out of service because of improved roadways and the invention of steamboats and steam engines used on railroads.